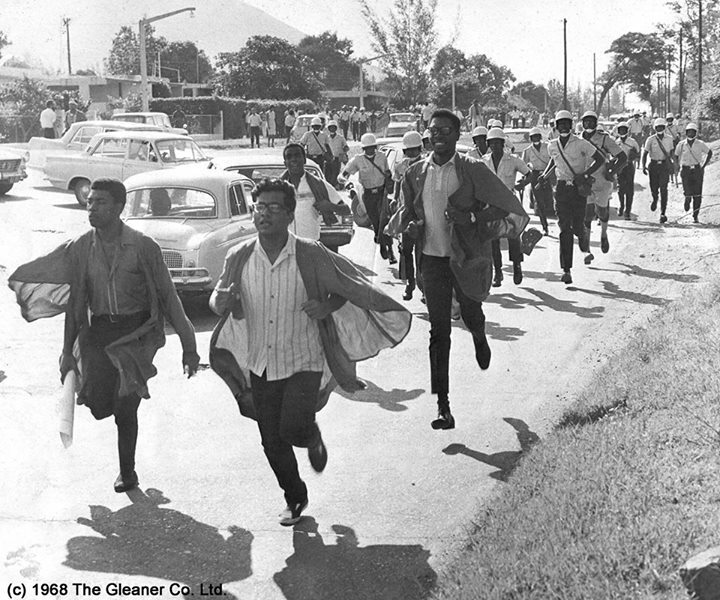 The photograph shows students of the University of the West Indies (UWI) who have broken through a police cordon along Mona Road, St Andrew, in 1968. The cops, armed with tear gas canisters and riot batons, are in hot pursuit. On October 16, 1968, the controversial Guyanese political activist and history lecturer, Walter Rodney, was barred entry to Jamaica following a trip to Montreal, Canada where he participated in a Congress of Black Writers. This was due to Rodney’s incendiary views related to black consciousness and his alleged involvement in “destructive, anti-Jamaican” activities in sections of the island. The ban sparked the infamous “Rodney Riots” in Kingston, led off by hundreds of UWI students and faculty members. As word of their demonstration spread, hundreds of Kingstonians joined in, destroying buses and setting more than 14 major fires. Read more about the protests here. Since 1998, the UWI has hosted the annual Walter Rodney Lecture in October to mark the anniversary of the riots and celebrate Rodney’s academic and activist legacy. Click here for related videos.